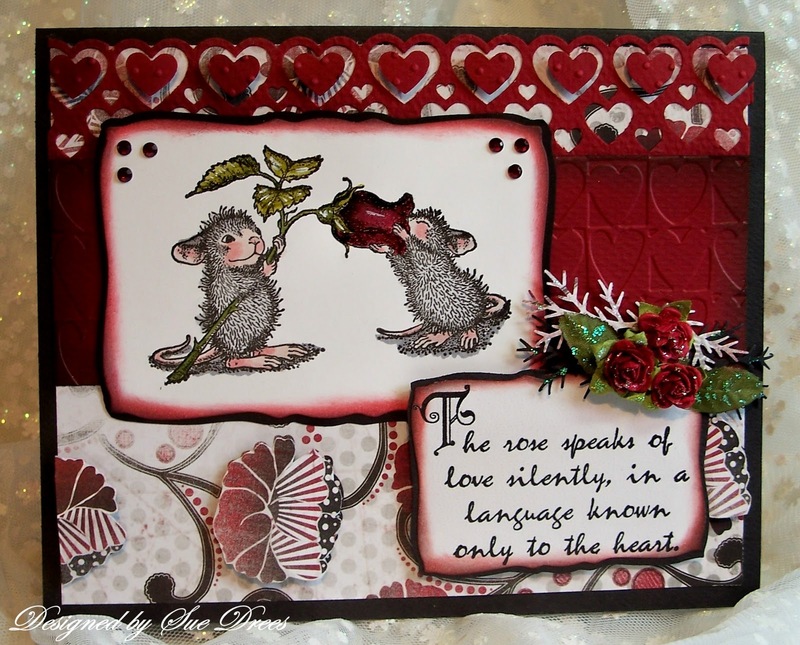 The challenge theme this week, chosen by our own talented Lori is to USE HEARTS ON YOUR CARD. With "love in the air" with Valentines Day coming up, this should be an easy challenge. Our challenge this week is being sponsored by House Mouse Designs and they have generously offered a $20.00 electronic gift card for their online store. 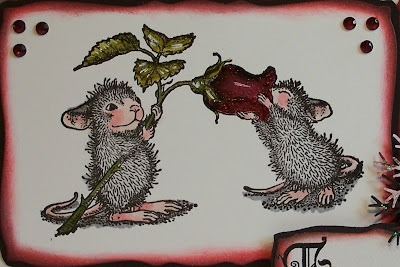 I chose this adorable image of the two mice smelling a beautiful red rose. The sentiment is by Verses, I love these words, hopeless romantic I guess! The roses are Prima and the paper is a piece I bought at AC Moore and I cut off the end that said who made it, sorry. The deep red layer was run through a Cuttlebug Folder. The Heart border is by Martha Stewart. I filled the larger heart cutouts with some of the smaller hearts from the same border punch. I used a Spellbinders die to cut out the image and the sentiment,then used distress ink, red and black to distress the edges. The card is 5 x 7 inches black cardstock. Close up of these sweeties. My fellow teammates have come up with some excellent cards for your inspiration, please check them out and leave them some love. Hope you will ink up a House Mouse, Gruffie or Happy Hopper stamp then add some hearts and enter the challenge. We look forward to checking out your blogs to see what you came up with. Please remember, the prize draw is a random draw, so everyone has an equal chance to win! We say goodbye to our January Guest Design Team member, Tracy. Tracy has done such a good job for us this month with beautiful entries to inspire others. Thanks so much Tracy. We are also welcoming back, after a long absence, Stacy, to the design team. Welcome Stacy! We are also looking for a guest design team member for each month, please see the House Mouse site for more information. A great card with so many hearts. Love the heart border and your coloring is fab! Beautful heart card, Sue! Hi Sue, wow this is stunning card. Amazing layout and such a gorgeous papers. Beautiful card Sue,I love the image and the colours. Gorgeous card I love the deep red colors. Absolutely stunning Sue, your colours and colouring are so fabulous. Fantastic design and I love all your details. Gorgeous card Sue, love the sentiment!